Hi all, I wanted to share the story of my AC rebuild process, and hopefully prevent others from making the same mistakes I did. After quite a few false starts and failures I have worked my way progressively through to a 100% rebuild of my AC refrigerant circuit. I am not a professional mechanic, nor do I have any formal training. I do have a good bit of wrenching experience, as well as a history with electronics. Please do not take my word as definitive, I am not an expert, please do your own research and consult a professional if needed. I bought this car in the fall, it had no service history but had a fairly new paint job and almost entirely new interior. I did not do as thorough of an inspection as I should have, however given the chance I would still buy the car today. It was a chilly morning when I bought the car, so my test of the AC was not very definitive, but it did seem to get cold. That winter I was running into problems with the heater so I ended up replacing the radiator, hoses, thermostat, temp sensors, and monovalve. Part Deux: The electrical and vacuum systems. In the course of some other work to the car, I pulled the dash. I knew I had some vacuum pods that were leaking, as well as a broken cabin temp sensor. I sourced some repair diaphragms for the vacuum pods from a forum member and rebuild all of my pods, as well as two faulty vacuum switchover valves, and all of the rubber hoses. With the help of a friend, I determined the correct part to rebuild the cabin temp sensor and repaired that. (PM me for info if you are interested). During the disassembly process I discovered that my CCU (control switches) had previously suffered an electrical fire - there was a hole burnt through the housing. It had been repaired previously with a jumper wire, but I decided to order a rebuilt unit instead, as the PCB was pretty well ruined. I also installed a new auxiliary water pump with a 2amp fuse in series. The following spring I discovered that the AC only worked on cool days. It had previously been converted to r134a. I discovered that it was leaking at the TXV. I tried some leak stop (bad idea) and added some r134a. Neither of which resolved the problem. Next I decided to try a minimally invasive fix: I had the r134a recovered by a shop, replaced the txv, drier, pressure switch and tried charging it again. This time the system would not develop suction enough to charge the system, also the compressor was making a horrible noise. Again I had a shop recover the refrigerant I tried to add (only about half a pound made it in). I dismantled the entire system, and ran four cans of flush through it (most of which was used in the evap and condenser. I found several clogs, I believe those were formed by the leak stop product I had used earlier, but I can not confirm that was the cause. I also purchased a new r4 compressor with clutch, and installed it. I had purchased a vacuum pump in the meantime (previously I was using one at a DIY mechanics shop) and tried to pull a vacuum, but was unable to hold a good vacuum (and yes, I am aware a vacuum test is not definitive). I had noticed that the high side line to the condenser was corroded, as well as the fitting on the condenser, so I decided to upgrade to a parallel flow condenser. I ordered a 16x24 condenser with custom mounting hardware and new hoses, and installed it along with a new drier. I finally tried to charge the system again, and was getting somewhat out of proportion high side pressures in comparison with the low side, and was not getting cold air. I then purchased a leak detector and had found a potential leak somewhere inside the evaporator housing when the system suddenly discharged. It turns out that the compressor bolts were never torqued fully, which allowed it to split in half. I never definitively determined if I had a leak other than that. A Sanden compressor with new mounting brackets. The compressor kit included a new compressor->condenser hose. Suction hoses. I will be using the original metal ends that connect to the TXV and the piece that runs across the engine. I will be rebuilding them with new barrier hoses and using crimp ferrules. A new condenser (Remember that I had previously installed a 16x24 PF condenser). A new evap. There are two evaps for the w123, one of which is NLA. I have the other style on order and hope it will fit without modifications to the housing. If it is not capable of fitting at all, I may have to have my original one professionally flushed and repaired. I may install a high pressure switch in the extra port at the TXV, to switch the fan if I am not satisfies with the temperature controlled switch. A universal fit 16" auxiliary fan. I will edit or reply to this post with further detailed information and pictures as the rebuild progress continues. I may post detailed DIY guides on individual steps. Please feel free to PM me any questions. Good luck. All new everything should do the trick. If it doesnt, I am going to give up and change hobbies to something less stressful. Maybe tight rope walking? It sure helped to completely rebuild my 98 E300's AC (all new except the hoses). Since yours is an 85. How is the klima unit? Open it up and make sure nothing looks burnt. How hard is it to replace the lower hose on an R4? After I get the system discharged? Good question. I will look! Not terrible. You do need to drop the compressor though. Its got a clamp near the alternator, one or two brackets then 3 huge bolts that hold the compressor to the engine. Be sure to keep track of which bolt goes where with what spacers. Please take voluminous photos since I will have to do this on two models. AC is an area where I never dabbled. The Klima unit is a large relay that's located inside a housing near the brake booster, right? If so, mine looks to have been replaced at some point in the car's history. It reads something like "AC Clutch Relay" from a different manufacturer, and the bottom half of the case has been sealed with silicone or something similar, so I can't open it. It does seem to have been replaced at some point though, as it's stamped with "20.06" - which I'd take to mean week 20 of year 2006? Assume yours is a 82-85 300D or at least OM617 engine. Can leave the R4 installed, just unbolt the hose manifold. Look for my post on PN's for new seal washers. You will need to disconnect the suction nut above the compressor (replace O-ring). Unbolt the triangle bracket on passenger side and the bracket behind the alternator. At least one of my 300D's (1985 CA?) had a fitting there and a 2nd tube that ran to the condenser via still another bracket on the frame. Might do like many here did (me) and toss that contraption and run a hose straight to the condenser. Cut the ferrules w/ a hacksaw and peel off. Slide new hose (-10 barrier) on the two outer fittings and secure w/ Oeticker stepless ear clamps. All available on ebay. Will be much easier to get at the alternator bolts in the future. This weekend I got the old compressor out and the new compressor in place. I still need to tension the belt and torque everything. I have been using some old touch-up paint to mark across the threads of each bolt and the nut to indicate that it has been torqued properly and give a visual indication if anything starts to loosen. Also pulled the dash, this is the second time I've done that, so its down to about a 1.5hr job. Roughly followed dmorrison's excellent guide at PeachPartsWiki: Replacing the A/C Evaporator. Pulling the evaporator housing was a bit more of a challenge. Again followed the same guide. The biggest problem I ran into was getting the heater hoses off at the firewall. I am pretty sure they have never been disconnected. I ended up cutting the three hoses so I could work a small screwdriver in to break them loose. Since I am also switching to zerex, now is a great time to replace all the hoses, although I haven't found a source for the hoses to/from the aux water pump. Hopefully that part is available somewhere. Next up was dismantling the evap housing. 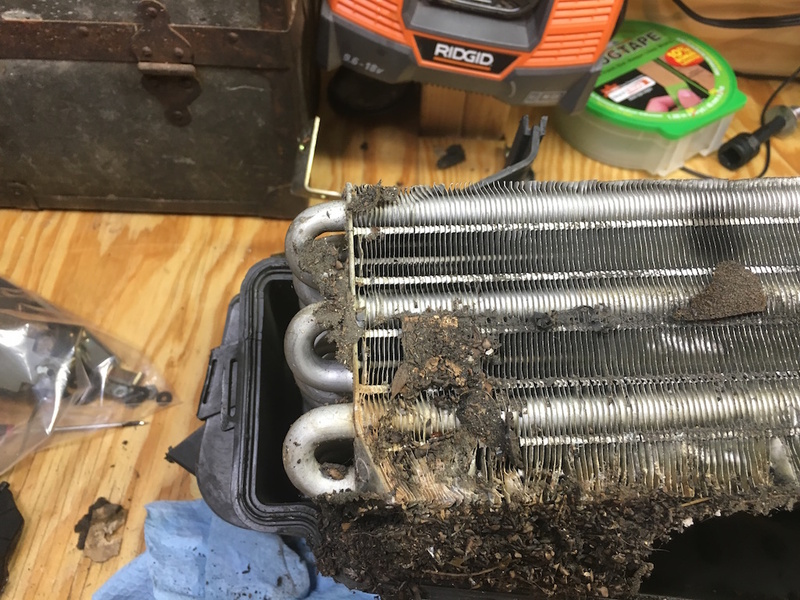 My heater core looks brand new. Unfortunately the evaporator is not so lucky. I would guess that it was 40% clogged. Clearly the foaming cleaner I used was nowhere near adequate. I don't see any obvious damage, besides for quite a few bent fins. I have the behr housing, but have not found a part number on the evap itself. I am still waiting on my new evap to make it from Germany, but I think it is for the other housing. I measured the previous new one (which was damaged in shipping) and it's dimensions are within about 1/4" of the original part. I am hoping it will fit without too much modification. If not I will have to source the other brand housing, or worst case clean, flush, and pressure test mine. Edit: pulling and dismantling the evap housing was roughly a four hour job after the dash was out. Probably an hour was spent trying to get the heater hoses disconnected. One tip is to use some compressed air to blow out the heater core so you dont have to worry about it draining on the floor. Last edited by Demothen; 08-14-2016 at 09:50 PM. Here's what the evaporator looked like, even after flushing with a foam cleaner while it was installed. Obviously the foam wasn't intended for flushing out this level of dirt. Maybe flushing it with a ton of water would have helped. Really surprised at how many fins are deformed - pretty sure it's original to the car and that the housing had never been opened, so apparently it got damaged during installation. Also, the heater core as it looked straight out of the car. Will probably give it a quick clean with some coil cleaner and reinstall as-is, or possibly after a bit of fin straightening if possible. I have not taken out my Behr evaporator (if it's NFG, work would stop right then and there) so I cannot tell what it looks like inside. On mine, the tubes that connect to the TXV are copper. Yours tubes look like it is aluminum? Do you have a pic of the other end of the evaporator? 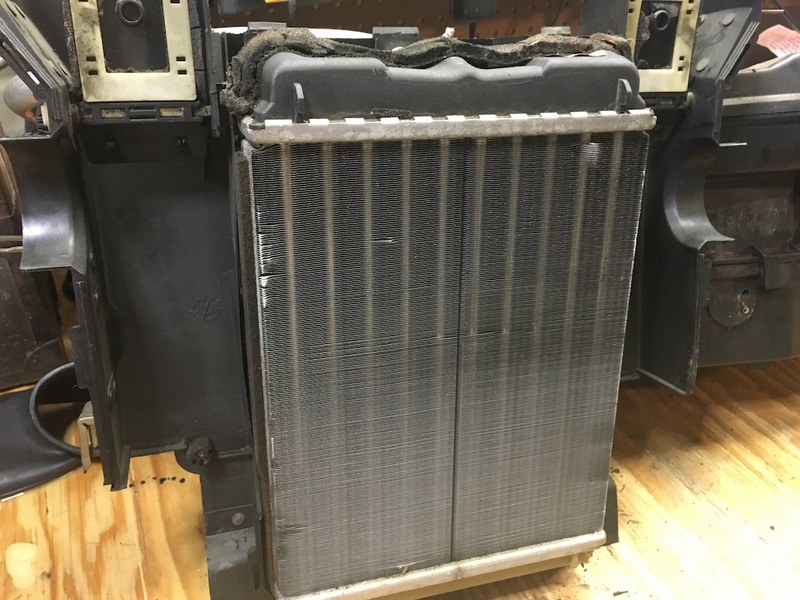 How about pics of the Siemens evaporator that was damaged in shipping?